The first precious cucumbers from the garden were immediately made into cucumber watermelon cooler, with the help of a store-bought melon. We’re having a heat wave and this drink definitely helped us cool down. No alcohol was added into this, because I wanted the kids to partake in the drinking. But feel free to add it in yours, in lieu of the club soda. 1. In a blender, puree cucumbers, watermelon, mint leaves and water. Pour through a fine-mesh sieve set over a pitcher. 2. Press on solids to extract as much juice as possible. 3. Stir in sugar or honey. 4. Add lime juice and club soda. 5. Pour into glasses filled with ice cubes. 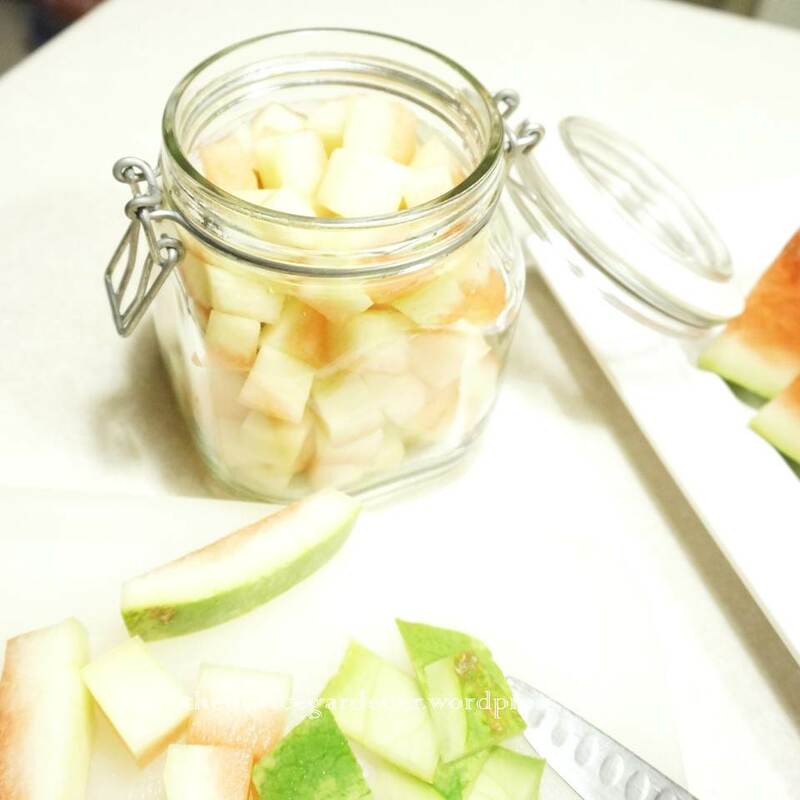 Then, I set aside some of the watermelon rind to pickle. Why? Because, because, because, because, because … sometime ago, I checked out this book, for some light reading. In it, there’s a recipe for these pickles. I’ve actually made these pickles before and I think I kind of liked it. I can’t remember for sure since it was a while ago. But, hey, the main ingredient is pretty much free, so what’s there to lose? I’ll find out in a few days if it’s a winner or not. If it’s not, I’m off to see the wizard! Update: I just realized I’ve been missing out on a lot of fun by not participating in Weekly Photo Challenge. And since the theme this week is Fresh, I decided to re-tag this post, ’cause you know, what could be fresher than Cucumber and Watermelon? I swear. We’re cooking doppelgangers. I made agua fresca this week with cucumbers, watermelon and elderflowers. And I LOVE watermelon pickles. LOL, I always knew that, scotchheather! I really need to find a source for elderflowers, so many are talking about elderflowers cordial lately. I used to have them in my old house, but back then I didn’t know what to do with them. I’ll bet that pickle recipe would work with zucchini. I might give it a try! You’re probably right, Granny! Let us know how they turn out if you decide to do it. I tried my pickles; they’re really good! I love the flavors, but then I’ve always liked sweet pickles. And they’re a tad too soft; I may have overcooked them. So, you might want to reduce the amount of sugar and cooking time. As for me, I still have the other half of the watermelon, so I can make another batch. No, I like them super sweet, that’s why I’m not happy with most refrigerator pickle recipes. I’d have to play with the cooking time, but I think I have a recipe for zucchini pickles that I could borrow the time from. Wow. 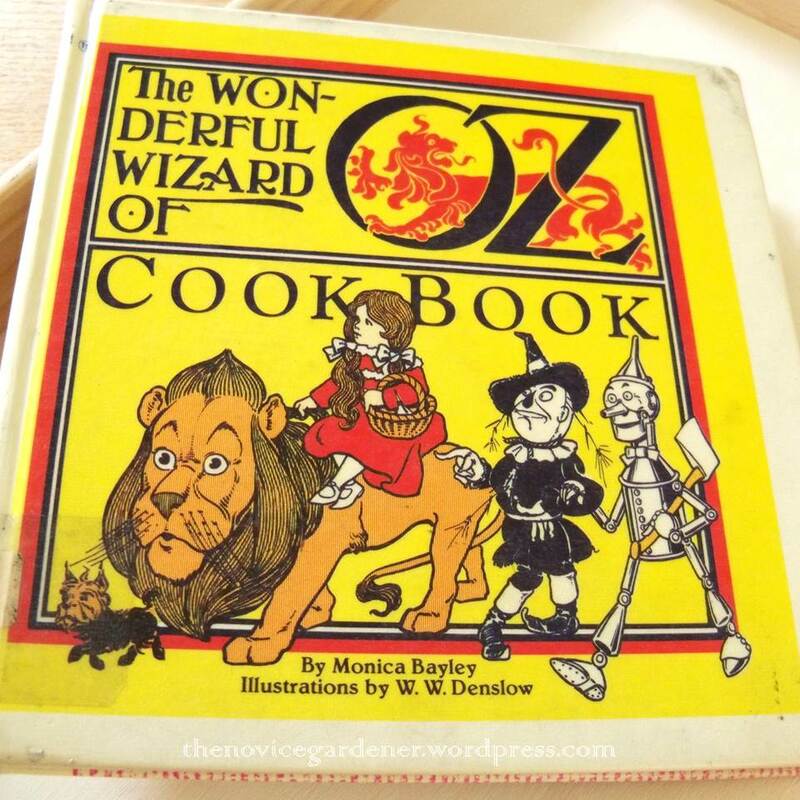 If I was already excited about the cucumber watermelon cooler, you completely swept me off my feet with The Wonderful Wizard of Oz Cookbook! 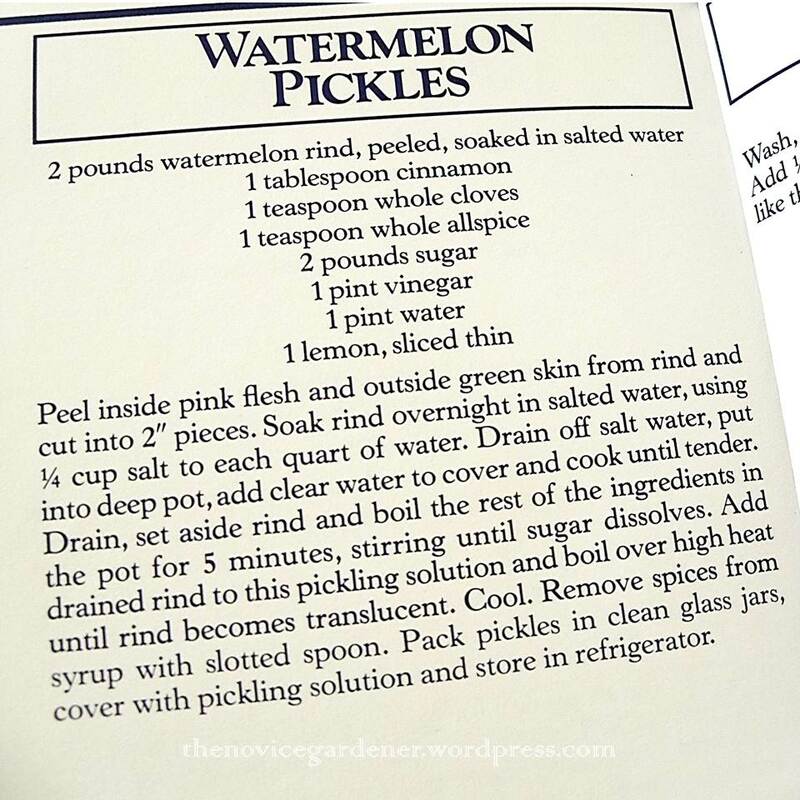 I don’t know why pickled watermelon rinds make me think of pickled cactus – which I love, so that’s definitely a good sign. I know, right? I love that kind of books, too! And pickled cactus? Haven’t tried those, sounds interesting. Yes, I’ve seen fresh nopales, just haven’t tried cooking with them. Not sure why, we loooove … Mexican food. We have tacos probably once a week. I’ll give them a try. Thanks for the idea, JB! The melon-cucumber cooler is a great idea, i could use one right now. I just picked up a bottle of St. Germain on sale, an elderflower cordial. Maybe a splash would be good in the cooler. This is definitely on the list to try just as soon as I get some cucumbers. I think St. Germain would be awesome in it, Dave! Hmm … My mouth is watering just thinking about it. I am looking for non-alcoholic drinks and this fits the bill perfectly. Found you via the No Rules Blog Hop. Enjoy, Barbara! I’m working on a Peach Basil drink right now. I’ll be sharing if it turns out well. Thanks for stopping by!